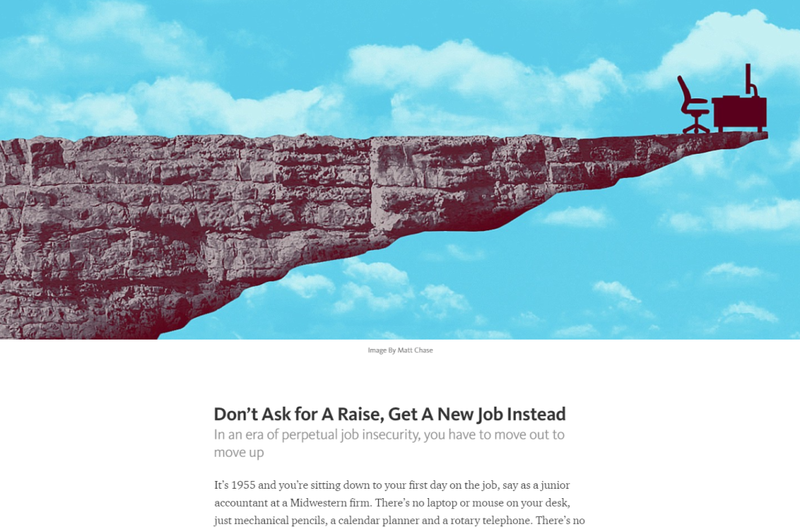 This week I wrote a piece of MEL magazine about job insecurity. 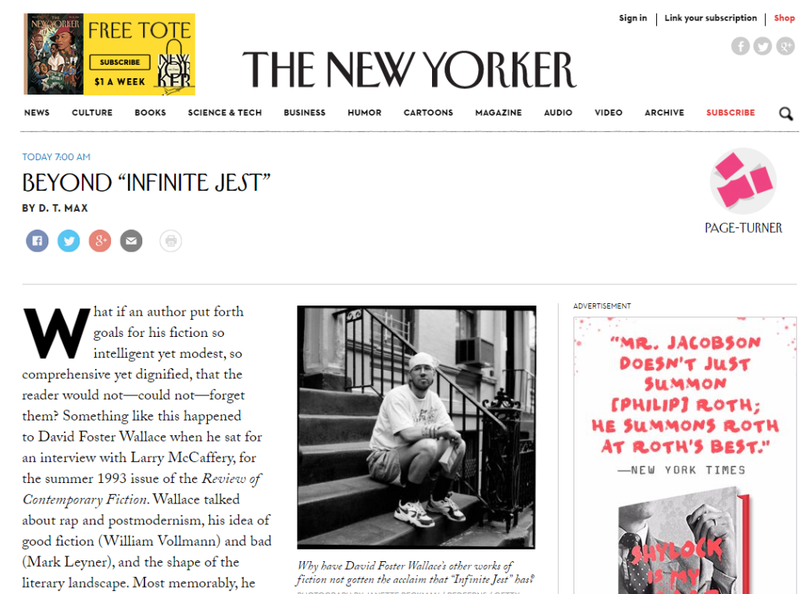 Also, I had a brief quote in this New Yorker piece about Infinite Jest. Over at Publishers Weekly, I interviewed author Laura Tillman about her new book The Long Shadow of Small Ghosts. As a Senior DeMolay, I was intrigued by Seth Anthony’s quest to track down all 137 recipients of the DeMolay Founder’s Cross. The Founder’s Cross was presented by Dad Frank S. Land, founder of the Order of DeMolay, to individuals personally loyal to him. After Dad Land’s death in 1959, no further Founder’s Crosses were awarded. 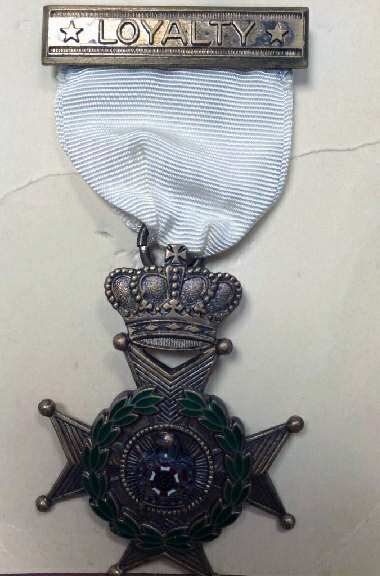 The first Founder’s Crosses were awarded in 1937. Its relative scarcity, and the high profile of many recipients, makes it perhaps the most prestigious award in the history DeMolay. In Seth Anthony’s spreadsheet of recipients, one name stood out to me: Robert T. Arthur. It was notable not because I knew Dad Arthur—he died in 1949—but because he was a resident of Denison, Texas. My family is from Denison. I went to Kindergarten and first grade there, my brother was born there, my mom, both my grandmothers, and many aunts and uncles still live there. It is as much of a homeland as I’ve ever had. But I know they have not had a DeMolay chapter there in a very long time. I joined the Order of DeMolay in Texas (Tyler) in 1992, and the chapter in Denison was a distant memory even then. I considered myself familiar with the history of Texas DeMolay, but I had never heard of Dad Arthur. So I enlisted the help of everyone I could find to help track down some vital details about Robert T. Arthur on the distant hope that he might have some surviving relatives who could tell us more about him or what happened to his Founder’s Cross. One individual, in particular, stepped forward to assist me in this search: Jim Sears. To him, I owe many thanks for tracking down these newspaper articles. His research skills are second-to-none. All of the photos below are a product of his research. Thank you, Jim. Robert T. Arthur was born in Missouri in 1867. His family moved to Pilot Point, in Denton County, Texas, when he was young. Pilot Point is the oldest settlement in Denton County. It is still an operating city (unlike nearby Pilot Grove, birthplace of Benny Binion), and is still associated with horse breeding. Arthur graduated from Denton Normal school (now called the University of North Texas). He then worked in Denton as a school teacher before moving to Denison to take a job with the Katy Railroad in 1889. He worked as a conductor on passenger rail lines for over 50 years. In 1893, at the age of 26, he was elected an officer (Senior Conductor) in the Denison Division of the Order of Railway Conductors (the union representing passenger rail workers). These newspaper articles are sometimes hard to read (and the text should be indexed by search engines) so I will transcribe them throughout. Division 53, of the Order of Railway Conductors, held an election of officers in their hall Thursday afternoon which resulted as follows: W.S. Oldham, C.C. ; W.H. Tobin, A.C.C. ; E.B. Kollert, secretary and treasurer; R.T. Arthur, S. C., Burt Cox, J.C.; J.L. Tygard, I.S. ; John Smythe, O.S. ; J.H. Dolan, G.F. Miller, Jeff L. Finley, local committee, John L. Tygard, Sam Proud, J.T. Strait, trustees and finance committee. Messrs. Daffin and Quinlan, of the Central, spent a few hours in Denison Friday. 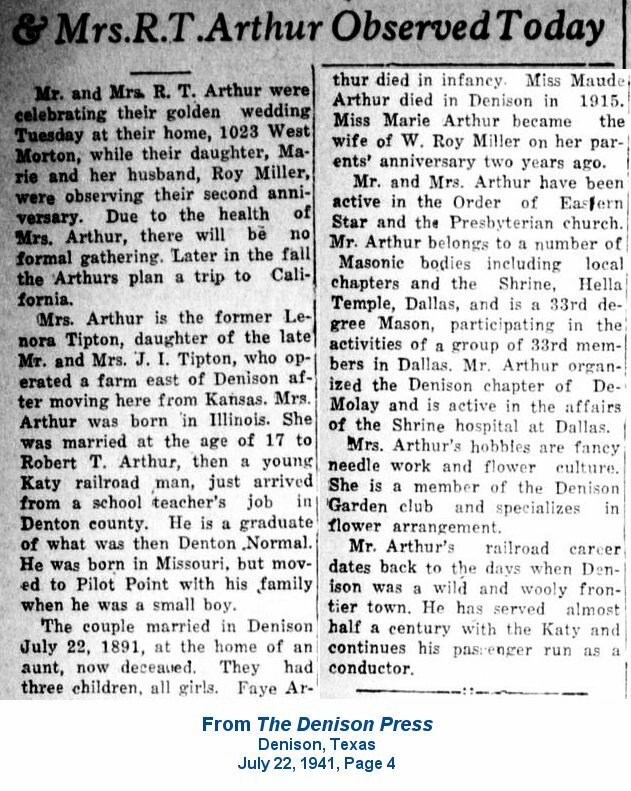 R.T. Arthur married Ms. Lenora Tipton in Denison on July 22, 1891. The couple had three daughters: Faye, who died in infancy; Maude, who died in 1916 at age 24, and Marie, who later married Roy Miller. Robert and Lenora celebrated 50 years of marriage in Denison in 1941. He was the organizer and first advisor to the Denison Chapter of DeMolay, founded in 1921. Much of this information is gleaned from the 1941 newspaper article below. Mr. and Mrs. R.T. Arthur were celebrating their golden wedding Tuesday at their home, 1023 West Morton, while their daughter, Marie and her husband, Roy Miller, were observing their second anniversary. Due to the health of Mrs. Arthur, there will be no formal gathering. Later in the fall the Arthurs plan a trip to California. Mrs. Arthur is the former Lenora Tipton, daughter of the late Mr. and Mrs. J.I. Tipton, who operated a farm east of Denison after moving here from Kansas. Mrs. Arthur was born in Illinois. She was married at the age of 17 to Robert T. Arthur, then a young Katy railroad man, just arrived from a school teacher’s job in Denton county. He is a graduate of what was then Denton Normal. He was born in Missouri, but moved to Pilot Point with his family when he was a small boy. The couple married in Denison July 22, 1891, at the home of an aunt, now deceased. They had three children, all girls. Faye Arthur died in infancy. Miss Maude Arthur died in Denison in 1915. 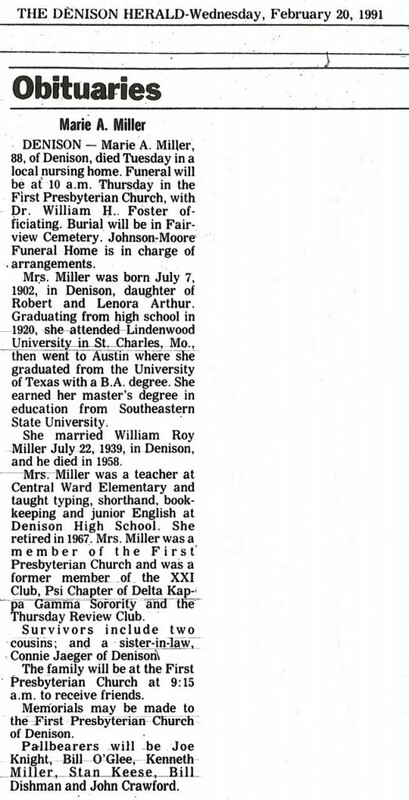 Miss Marie Arthur became the wife of W. Roy Miller on her parents’ anniversary two years ago. Mr. and Mrs. Arthur have been active in the Order of Eastern Star and the Presbyterian Church. Mr. Arthur belongs to a number of Masonic bodies including local chapters and the Shrine, Hella Temple, Dallas, and is a 33rd degree Mason, participating in the activities of a group of 33rd members in Dallas. Mr. Arthur organized the Denison chapter of DeMolay and is active in the affairs of the Shrine hospital at Dallas. Mrs. Arthur’s hobbies are fancy needle work and flower culture. She is a member of the Denison Garden club and specializes in flower arrangement. 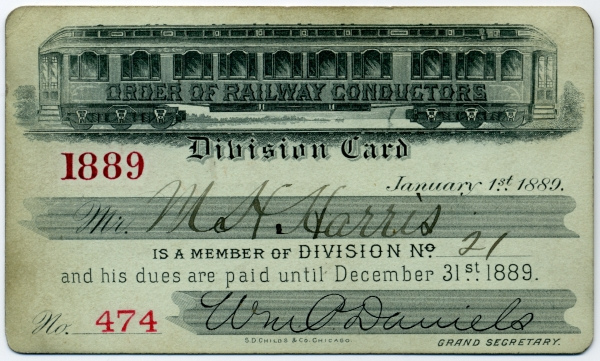 Through his travels as a railroad conductor, R.T. Arthur was able to travel across Texas at free or reduced rates, easily attending Scottish Rite, Shrine, and DeMolay meetings in Dallas and beyond. It’s telling that a man, like Frank S. Land himself, who had no sons of his own, organized a group of young men into a fraternal organization that was a model for others. What tragedy to bury two daughters. His surviving daughter, Marie, married Roy Miller and taught at Denison High School for many years. She passed away in 1991, leaving Robert T. Arthur with no living descendants. 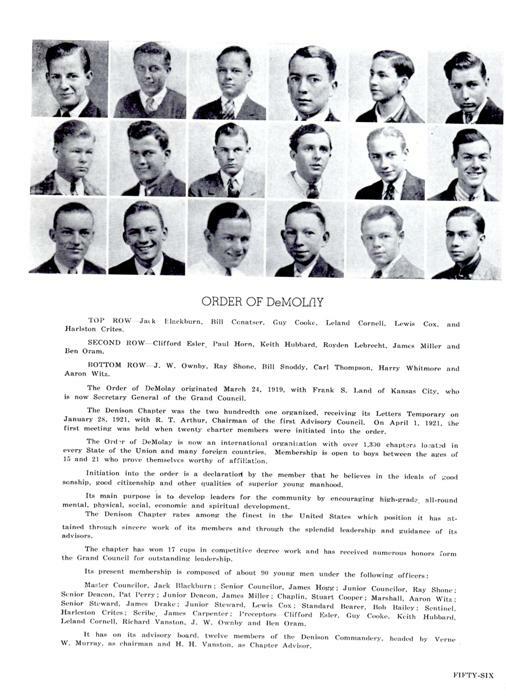 The Order of DeMolay for boys was organized Frank S. Land in Kansas City, Missouri. The first meeting was held March 24, 1919. More chapters were quickly founded across the country. 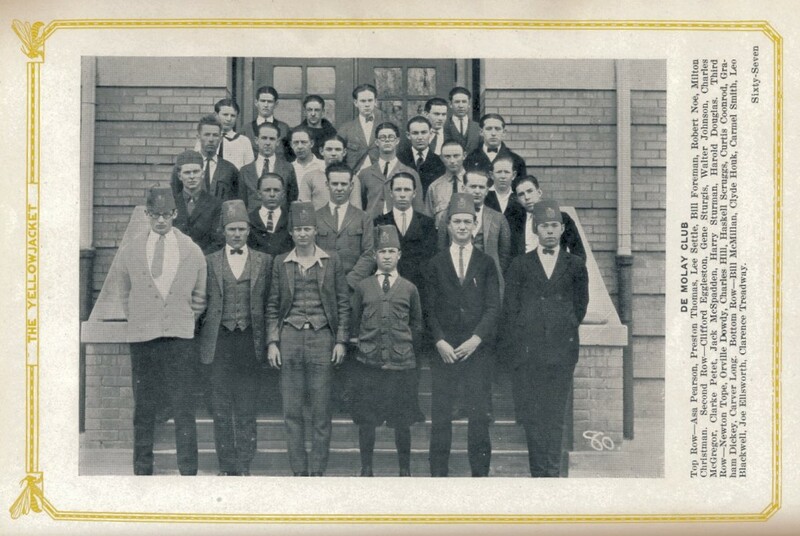 The chapter in Denison, Texas, was organized in January 1921. It was the 200th chapter founded, with Letters Temporary granted on January 28, 1921. Denison was one of the first chapters of DeMolay in Texas. Ameth Chapter, in El Paso, was the first: it was founded in 1920. 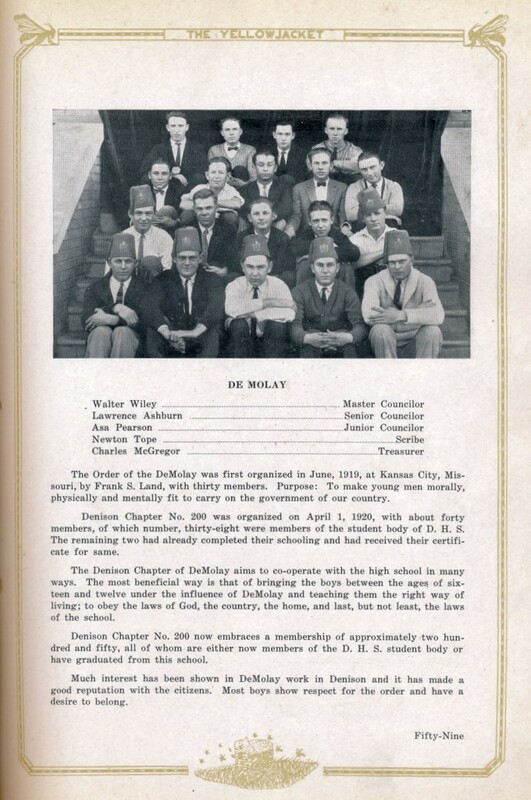 The Denison High School Yearbook from 1937 includes this page of the members and a brief history of the chapter. The Order of DeMolay originated March 24, 1919, with Frank S. Land of Kansas City, who is now Secretary General of the Grand Council. 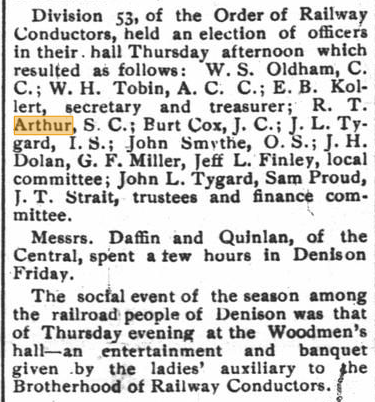 The Denison Chapter was the two hundredth one organized, receiving its Letters Temporary on January 28, 1921, with R.T. Arthur, Chairman of the first Advisory Council. On April 1, 1921, the first meeting was held when twenty charter members were initiated into the order. The Order of DeMolay is now an international organization with over 1330 chapters located in every State of the Union and many foreign countries. Membership is open to boys between the ages of 15 and 21 who prove themselves to be worthy of affiliation. Initiation into the order is a declaration by the member that he believes in the ideals of good sonship, good citizenship and other qualities of superior young manhood. Its main purpose is to develop leaders for the community by encouraging high-grade, all around mental, physical, social, economic and spiritual development. The Denison Chapter rates among the finest in the United States which position it has sustained through sincere work of its members and through the splendid leadership and guidance of its advisors. The chapter has won 17 cups in competitive degree work and has received numerous honors from the Grand Council for outstanding leadership. Master Councilor, Jack Blackburn; Senior Councilor, James Hogg; Junior Councilor, Ray Shone; Senior Deacon, Pat Perry; Junior Deacon, James Miller; Stuart Cooper, Chaplain; Aaron Witz, Marshal; James Drake, Senior Steward; Lewis Cox, Junior Steward; Bob Bailey, Standard Bearer; Harleston Crites, Sentinel; James Carpenter, Scribe; Preceptors: Clifford Ealer, Guy Cooke, Keith Hubbard, Leland Cornell, Richard Vanston, J.W. Ownby, and Ben Oram. As far as I can tell, the chapter was active and productive from 1921 until the 1960s. One of the high points in the life of the chapter came in 1937 when Dad Arthur was awarded the Founder’s Cross by Frank S. Land at the Conclave in Waco. The legion of honor, the highest distinction which a DeMolay can receive, was conferred on five young men of Texas last night by Frank S. Land of Kansas City, founder of the Order of DeMolay. Mr. Land also presented for the first time in the history of the order, his personal founders cross to three men, Alva Bryan, Robert Arthur, and Lee Dewey in recognition of their faithful work with DeMolay in Texas. Those who received the legion of honor for outstanding leadership in some worthwhile endeavor are as follows: Mandell H. Cline, Mexia; Elwood Henry Brown, Houston; Maxwell Goodman, Fort Worth; Randolph Jackson, Hillsboro, and Robert Lewis, Hillsboro. At an altar of white, surrounded by white candles, the five candidates for the degree knelt and took their vows from Mr. Land. Each preceptor placed a bouquet on the altar. A choir furnished the music. This degree was the first event of a three-day session of the state DeMolay conclave, which continues through Saturday. Today there will be the business sessions until 5:30 p.m. at which time there will be a downtown parade featuring stunts, and each chapter in Texas will be represented. A banquet and three-hour floor show will be presented tonight starting at 7:30 o’clock for all registered DeMolays. Officers who conducted the ceremony were as follows: Commander in the east, Frank S. Land; Commander in the west, James Blundell; commander in the south, Pat Taggart; herald, Sidney Dobbins; grand marshal, J. Floyd Smith; grand chaplain, Jack H. Harrison; first preceptor, R.L. Othling; second preceptor, Hugh Keahey; third preceptor, George Denton; fourth preceptor, Billy Smith; fifth preceptor, George Lovell; sixth preceptor, Alva Bryan; and seventh preceptor, Lee Glasgow of Cleburne. As apart of the ceremony Thursday night, Columbus Avenue Baptist church choir, under direction of Harry Lee Spencer, sang. Former members of Waco chapter who have received the Legion of Honor degree are Tom Mabray, Hugh Keahey, Guy Blair, Pat Taggart, Jack Grove, Jack Harrison, Melvin Mailander and Theodore Lauck. Registration for Waco DeMolays began Thursday morning at 10 o’clock at the Shrine temple. At 3 o’clock that afternoon official registration for visiting DeMolays began in the lobby of Hotel Raleigh. With the exception of the legion of honor ceremony Thursday night, no admission was granted to any session without the registration badge. This event marked the first time that Dad Land had awarded a Founder’s Cross. If they went alphabetically, Robert T. Arthur might have received the very first Founder’s Cross, though Alva Bryan was Executive Officer at the time and might have come first in precedence for Dad Land. It is a remarkable honor that Texas DeMolay Conclave hosted Dad Land personally awarding the Legion of Honor and Founder’s Crosses on this day in 1937. Thanks again to Jim Sears for providing these images and researching all of this with me.